Sophos Wireless managed from Sophos Central With Sophos Wireless you can manage your wireless networks alongside other Sophos solutions or use our Sophos Central management platform solely for wireless network setup and control. 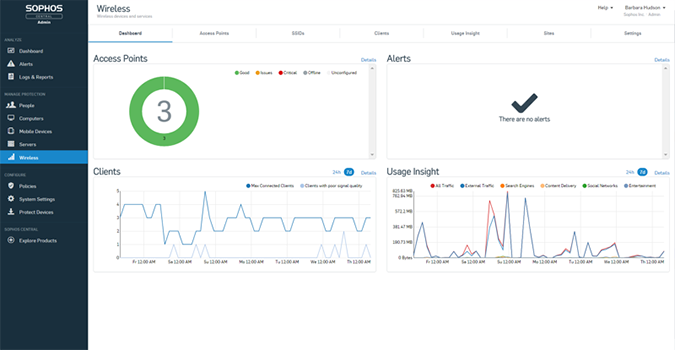 One dashboard for an at-a-glance status The Sophos Wireless dashboard is your single pane of glass to get the status of your wireless networks, access points, connected clients and identify potential issues needing attention. Get all the key information at-a-glance in a concise manner and on a single screen. Simple deployment and administration Using the step-by-step guidance in our on-boarding wizard, creating networks, registering access points and adding sites is child's play. Our solution is built to be simple to use - even for non-wireless experts - but that doesn't mean you forfeit functionality. Schedule firmware upgrades to keep your network up-to-date and deploy new features. Increased visibility and control See which traffic is using your bandwidth to optimize the performance of your Wi-Fi and alert you to potential unwanted use of your resources. With Sophos Wireless you'll know exactly what's happening with your users and your wireless networks to avoid behavior which could put your security at risk. Secure guest access and hotspot setup Provide controlled internet access for visitors, contractors and other guests on your network. Using a daily password or time-based voucher, you can customize guest access with your own terms of service and branding. Use enterprise-grade backend authentication for a seamless user experience. Our APs are built on the latest enterprise-class, high-speed wireless chipsets with custom designed antennas, added CPU and memory resources, and hardware accelerated encryption. Download the Sophos Wireless Data Sheet (PDF).